Poignant. Sophisticated. Elevating. Witty. These are just some of the adjectives to describe Breast in Show, now appearing at the Gaithersburg Arts Barn. 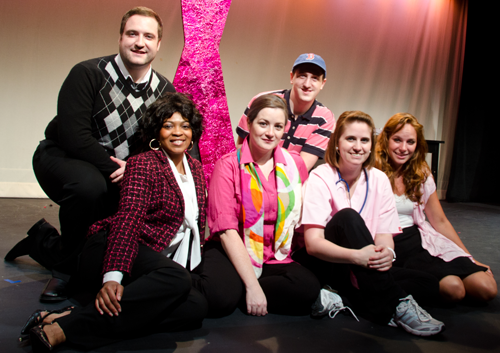 First conceived in 2009 by Executive Producer Eileen Mitchard, it is a show designed to reach people far and wide, to educate and empower audiences about breast cancer and its “warriors.” A musical about breast cancer? Morbid? Absolutely not. 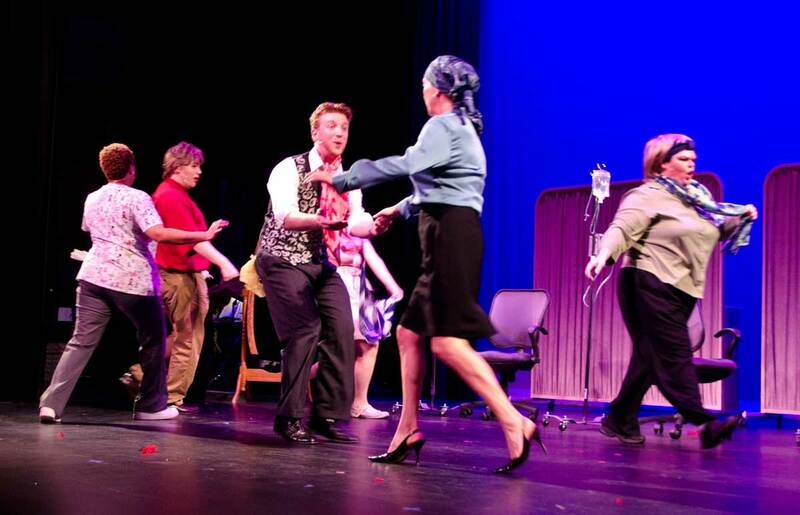 It is a tasteful production that will move you and amuse you all at once. Left to right (top row) Matt Dewberry, Chris Rudy (bottom row) Ayanna Hardy, Megan Westman, Jennie Lutz, and Gracie Jones. Photo by Betty Adler. Left to right (top row) Matt Dewberry, Chris Rudy (bottom row) Ayanna Hardy, Megan Westman, Jennie Lutz, and Gracie Jones. Photo by Betty Adler. Mitchard astutely brings on Playwright Lisa Hayes and Composer and Lyricist Joan Cushing to write the book and to compose the score and they deliver a heartfelt and humorous and poignant book and score. 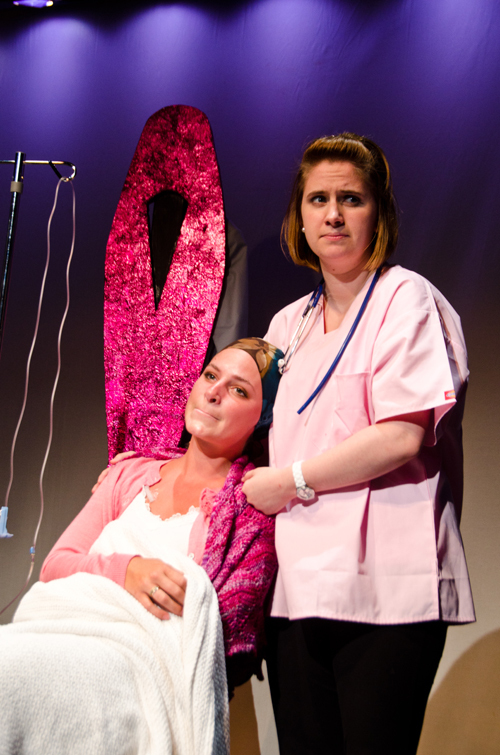 Hayes and Cushing use the true stories of patients to craft the new story of five breast cancer patients and their loved ones. 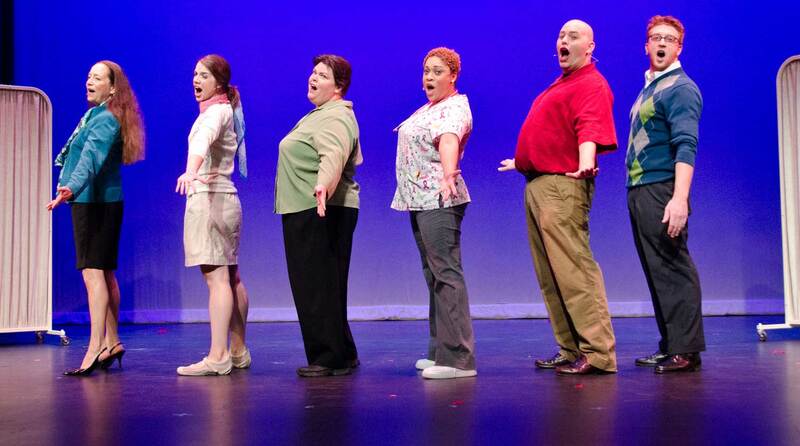 Bringing the words and music to life are Director Kathryn Chase Bryer, Musical Director Deborah Jocobson (on keyboards with Dana Gardner on Reeds), Choreographer Ilona Kessel and their ideal cast. The director and her team make unique use of the intimate Arts Barn stage. Their staging and choreography is meticulous and genteel. I particularly enjoyed the choreography and movement in the opening number “Breast in Show,” where all cast members were moving together yet apart -each in their own realm, yet totally in sync. 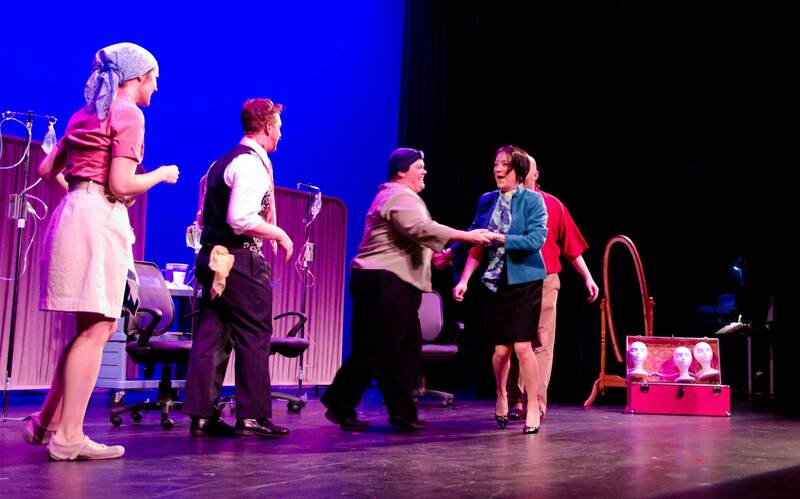 Playing 16 different characters throughout the show, the ensemble of six veteran actors is superb. 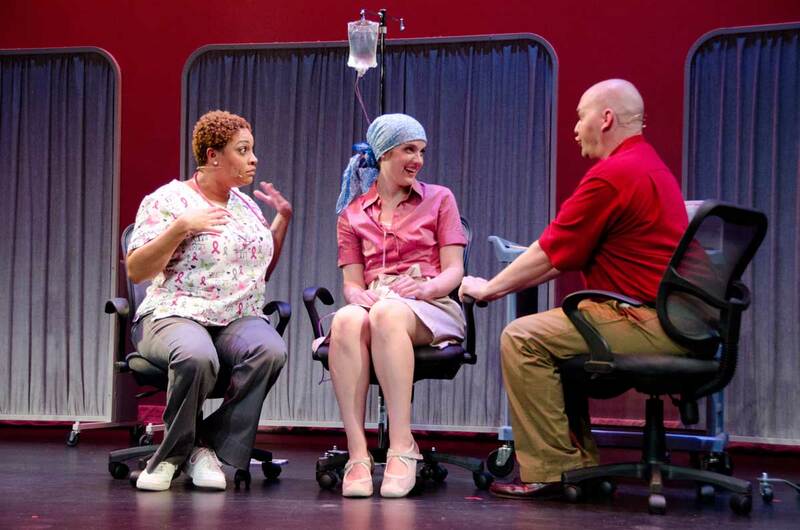 Megan Westman, as Nurse Desiree, is caring and cheerful, and always the eternal optimist. 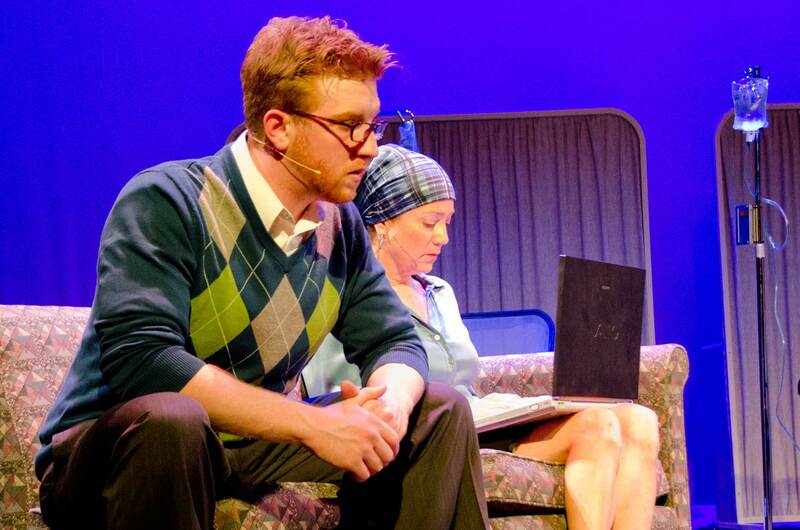 Jennie Lutz, as the grandmother is fun and bawdy, singing “I am in Love with My Oncologist.” Playing the male patient, something more common than most realize, is Chris Rudy. Rudy is sympathetic and entertaining, quipping along with his fellow patients, keeping their moods high. He is joined by Gracie Jones, Darren McDonnell and Ayanna Hardy in one of the most gripping songs of the evening, “Normal.”It’s a song about two couples and their desire to feel normal again after the surgery, and the delivery is stunningly beautiful, filled with gorgeous harmonies. Ayanna Hardy plays the strong willed attorney, Wendy. 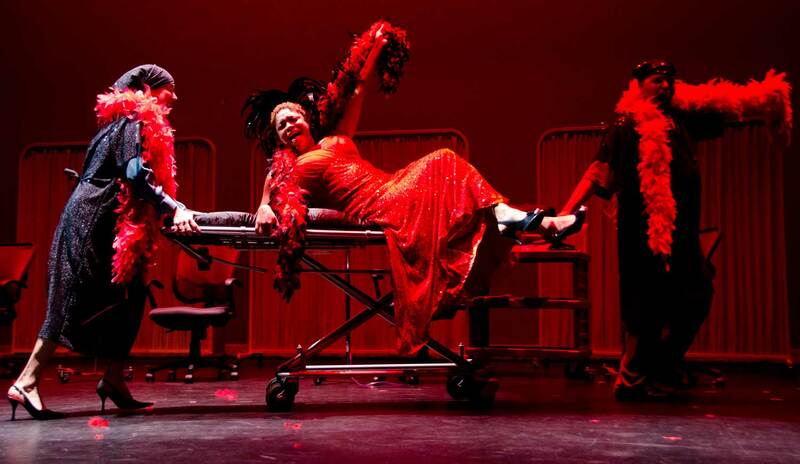 The only ensemble member not wearing a shade of pink, she refuses to yield to her diagnosis. Her breakdown in the song “Pink” sent shivers up my spine. By the end of the show she has fully embraced her diagnosis and her fight, and the transformation of this “warrior” is joy to watch. 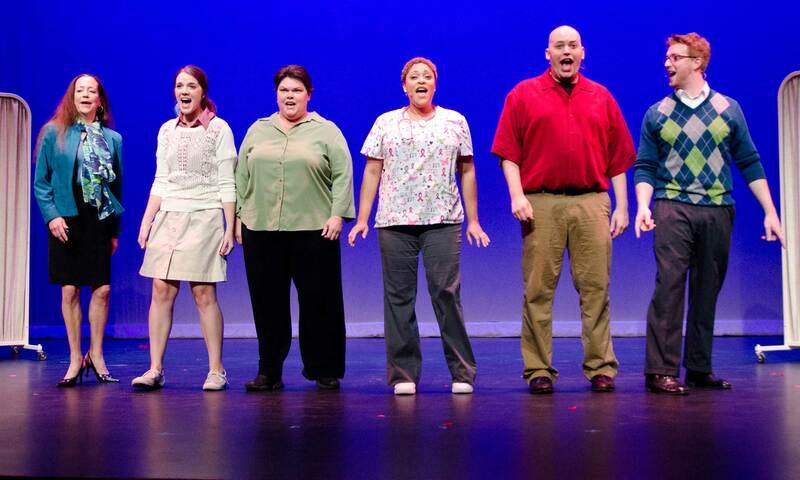 Gracie Jones ( Chelsea) sitting sings the song “A Nurse Named Desiree.” Megan Westman (Desiree) is standing. Photo by Betty Adler. Darren McDonnell is touching as Wendy’s supportive and encouraging husband. His short monologues about his struggle caring for his wife are affecting and heartwarming. McDonnell then effortlessly transforms into the jovial Freddy, a friend of Nurse Desiree who helps to heal Breast Cancer patients by supplying glamorous wigs and prostheses . His rendition of “Freddy’s Prosthesis Emporium” is one of the scene stealing moments of the evening. One of the most powerful performances of the evening comes from actress Gracie Jones. She plays multiple roles, but her portrayal of the young single mother Chelsea is remarkable. From her demure introduction to the group of cancer patients in the ‘Chemo Café,’ to the subtle interaction with her therapist regarding her “bad dreams” and her future is spot on. He heart-wrenching rendition of “A Nurse Named Desiree” is incredible – so real, so raw. 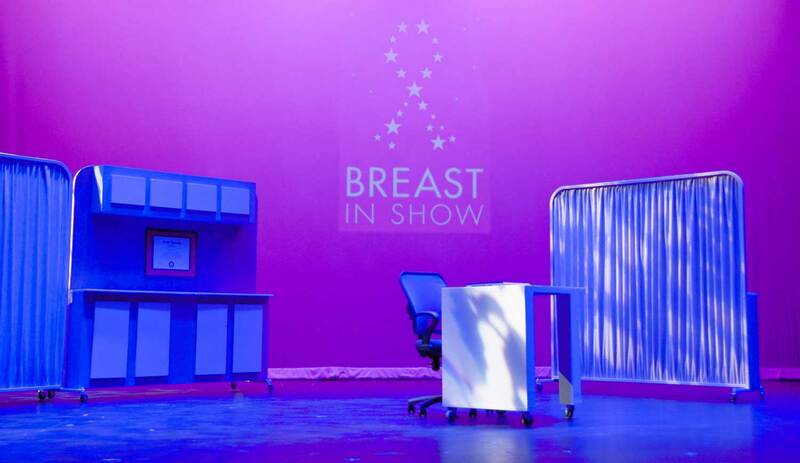 Breast in Show is a little gem waiting for you this month at the Gaithersburg Arts Barn. Shows like Breast in Show do not come often, so don’t miss it. 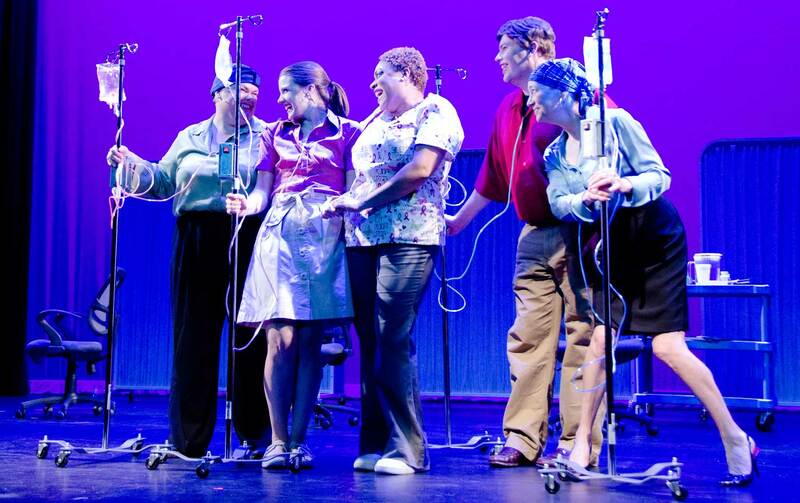 Breast in Show plays through September 27, 2014 at The Gaithersburg Arts Barn -311 Kent Square Road, in Gaithersburg, MD. Tickets range from $20 to $25. For tickets and information call (301) 258-6394, or visit the Gaithersburg website, or purchase your tickets at the door. Friday, Sept. 12th at 8 p.m.
Saturday, Sept. 13th at 8 p.m.
Sunday, Sept. 14th at 2 p.m.
Friday, Sept. 19th at 8 p.m.
Saturday, Sept. 20th at 8 p.m.
Sunday, Sept. 21th at 2 p.m.
Friday, Sept. 26th at 8 p.m.
Saturday, Sept. 27th at 2 p.m.
Saturday, Sept. 27th at 8 p.m. The Friday, September 19th 8 PM performance will be sign interpreted.